Sean Jones (trumpet); Orrin Evans (piano); E.J. Strickland (drums); Kenny Davis (ac. bass); Gerard Wilson Orchestra; Oscar Castro-Neves (guitar, vocals, keyboards); Julien Labro (accordion, accordina); Evan Perri (guitar); Dave Bennett (clarinet); Paul Brady (rhythm guitar); Colton Weatherston (rhythm guitar); Shannon Wade (acoustic bass); Ilona Knopfler (vocals); Greg Hutchinson (drums); James Genus (bass); Alain Mallet (piano); Andy Snitzer (s. sax); Jay Ashby (percussion); Bud Shank (alto sax); Mike Wofford (piano); Joe LaBarbera (drums); Bob Magnusson (bass); Mulgrew Miller (piano); Oscar Brown Jr. (vocals); Calvin Brunson (keyboard); Cecile Savage (bass); Steve Cobb (drums). 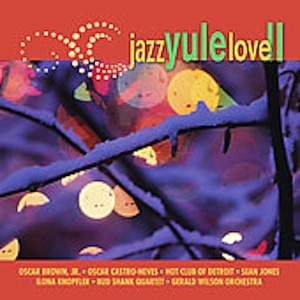 The second volume of Mack Avenue Records Jazz Yule Love includes traditional jazz versions of “O Holy Night” by Sean Jones, “I’ll Be Home for Christmas” by Ilona Knopfler, and “Dance Natal (Dance of the Sugar Plum Fairies)” by Oscar Castro-Neves, mixed with lighter seasonal fare like “Let It Snow” by the Bud Shank Quartet, “Jingle Bells” by the Gerald Wilson Orchestra, and even an instrumental take on “The Chipmunk Song,” courtesy of the Hot Club of Detroit. This is about Jazz Yule Love II, a CD about Christmas. But to me it’s more than that. This is primarily a CD about artists because that is what Mack Avenue Records is about…its artists. It’s about Sean Jones blowing his heart out with “Have yourself A Merry Little Christmas” and again in “O Holy Night.” And if you thought that if you never heard “Jingle Bells” again, you’d be just fine, I have news. You haven’t heard Gerald Wilson’s Orchestra’s rendition. It’s a great arrangement and beautifully executed. And then there’s Hot Club of Detroit doing “God Rest Ye Merry Gentlemen” and believe me, there’s no rest for them on that one, and after that there’s “The Chipmunk Song” with Dave Bennett’s clarinet tearing it up. Oscar Castro-Neves, a consummate and prodigious talent, arranged both “Air On A Six String” and “Dance Natal.” There’s Ilona Knopfler’s wistful “I’ll Be Home For Christmas,” hitting every note squarely on the nose and always in full control, and Bud Shank playing “Let It Snow” on the alto saxophone as only he can play. and finally Oscar Brown, Jr. singing “Another Year,” where every once in a while I hear slight shades of Al Jolson. It’s wonderful. They’re all wonderful. So there you have it, from the artists to you. I hope you appreciate them. I know we do here at Mack Avenue. Merry Christmas and Happy Holidays! Another Year by Oscar Brown, Jr.
© 2006 Mack Avenue Records, Inc.